I caught this on a box at the Crossroads Village & Huckleberry Railroad. 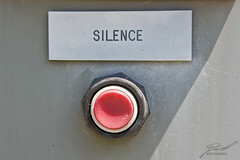 It was only to quiet an alarm, but I want one of these buttons available to me whenever I desire. I'd love to be able to hit a button that would silence the noises of the world when we're sitting down to record a podcast, or when I have a headache.